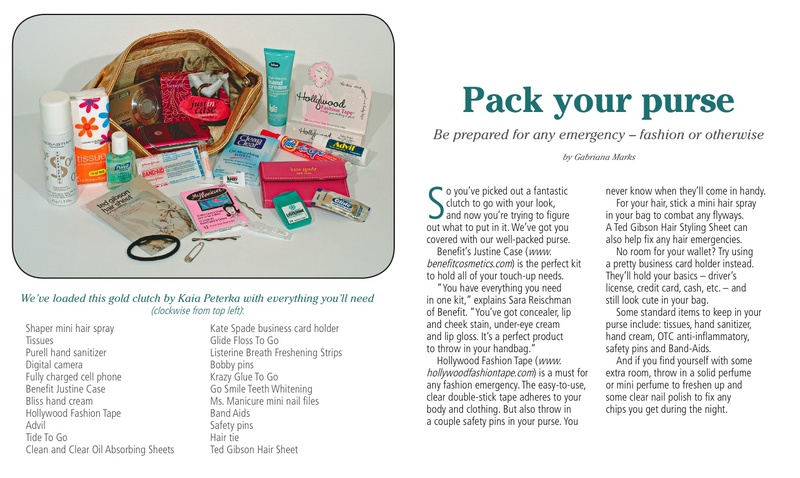 Be prepared for any emergency ― fashion or otherwise. So you’ve picked out a fantastic clutch to go with your look, and now you’re trying to figure out what to put in it. We’ve got you covered with our well-packed purse. Benefit’s Justine Case (www.benefitcosmetics.com) is the perfect kit to hold all of your touch-up needs. Hollywood Fashion Tape (www.hollywoodfashiontape.com) is a must for any fashion emergency. The easy-to-use, clear double-stick tape adheres to your body and clothing. But also throw in a couple safety pins in your purse. You never know when they’ll come in handy. For your hair, stick a mini hair spray in your bag to combat any flyways. A Ted Gibson Hair Styling Sheet can also help fix any hair emergencies. No room for your wallet? Try using a pretty business card holder instead. They’ll hold your basics – driver’s license, credit card, cash, etc. – and still look cute in your bag. hand cream, OTC anti-inflammatory, safety pins and Band-Aids. And if you find yourself with some extra room, throw in a solid perfume or mini perfume to freshen up and some clear nail polish to fix any chips you get during the night.